On May 15, 1863—150 years ago today—Confederate General Thomas “Stonewall” Jackson was laid to rest in his beloved Shenandoah Valley. He had died five days previously and, since his death, his remains had traveled from Guinea Station down to Richmond to rest in the Confederate capitol before beginning the trek westward. “He left the Va. Military Institute in command of the Cadets. He has been brought back to sleep among us—a world renowned hero,” wrote the Lexington Gazette. Buried in downtown Lexington, the cemetery now boasts a memorial statue over the grave of the Confederate leader. 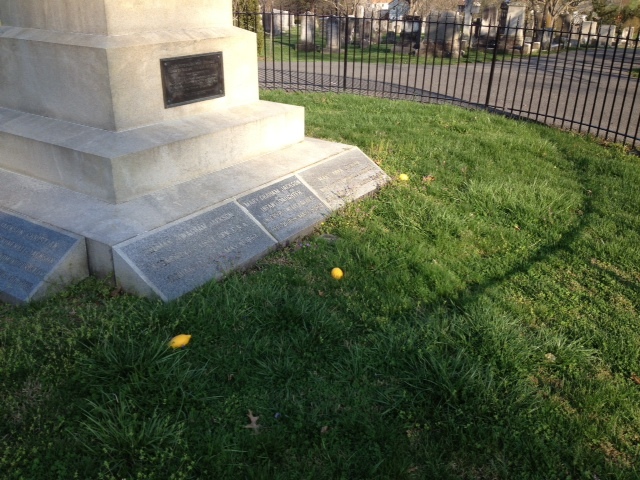 One can still throw a lemon in the iron gate that surrounds the monument or walk through and visit the actual gravesite. Laid to rest in that cemetery are a few other notable personas of the Confederacy. But, one officer made the trip to Lexington slightly before the great “Stonewall.” Elisha “Frank” Paxton was killed on the assaults around Hazel Grove on the morning of May 3, 1863. He was linked with Jackson by first being on the staff of the general and then gaining command of the famous “Stonewall” Brigade. Paxton was a native of Rockbridge County, Virginia and attended Washington College, next door to VMI before heading north to finish school at Yale. He returned to Lexington to begin his career. Entering the war as a lieutenant in the 4th Virginia Infantry he was wounded at First Manassas and after recuperation was appointed major in the 27th Virginia Infantry. Although he lost out on the election of officers the next year—1862—he gained an appointment on the staff of “Stonewall” Jackson. After rising to other positions on Jackson’s staff, his relationship with Jackson would later funnel him from major to brigadier general and in charge of the “Stonewall” Brigade. One of the only times Jackson would eschew military protocol in choosing to promote an officer to another command. Paxton would lead the brigade at the Battle of Fredericksburg in December 1862 and into the Chancellorsville campaign. On May 3rd, Paxton was leading his brigade on the attack on Hazel Grove when he was shot, according to Lieutenant Randolph Barton of his staff through the heart. He died within the hour of receiving his wound. 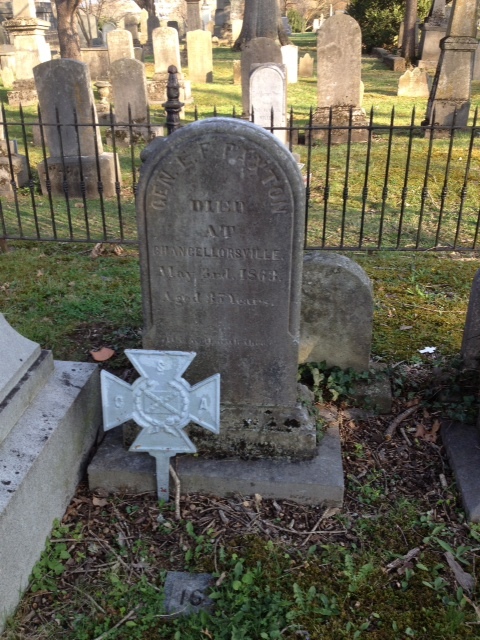 His body was initially laid to rest at Guinea Station before following his former commander out to Lexington. The Confederacy lost only two general officers killed during the Battle Chancellorsville, Paxton and Jackson, and claimed Lexington has their home. There are a few stories or history or legend or myth—whichever you’d prefer to call it—but according to one of these accounts, soon after “Stonewall” was laid to rest in Lexington angels descended from heaven to claim his soul. When arriving at the gravesite they could not locate Jackson’s soul. When they returned to heaven to tell St. Peter the bad news, they were shocked with his answer. St. Peter told the angels that Jackson’s soul was already in heaven; he had flanked the pearly gates and flanked marched in! For the citizens of Lexington, she could have been speaking for all their native and adopted sons that had fallen. Used as a source and for further reading into the last days and death of “Stonewall” Jackson was Christopher Mackowski’s and Kristopher White’s “The Last Days of Stonewall Jackson” part of the ECW series. This entry was posted in Emerging Civil War, Emerging Civil War Series, Leadership--Confederate, Memory, Monuments, Personalities and tagged Battle of Chancellorsville, death of Stonewall Jackson, Elisha Paxton, Guin, Guinea Station, Hazel Grove, Lexington, Stonewall Brigade, Stonewall Jackson, Virginia, VMI. Bookmark the permalink. 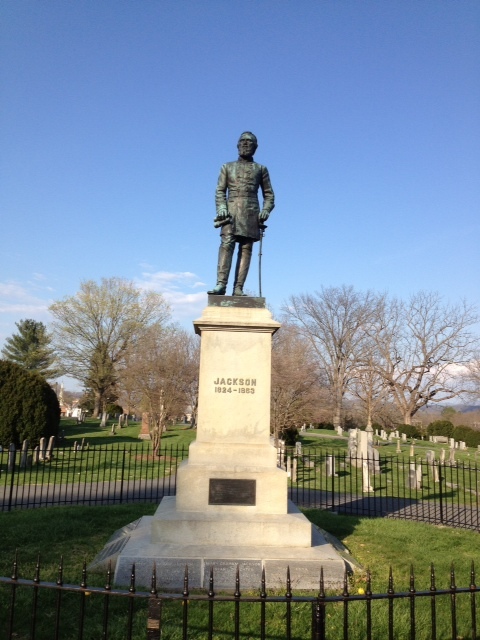 According to James I. Robertson’s biography, as soon as Jackson’s body arrived in Lexington it was taken to VMI to lay in state all that afternoon and night (May 14-15) in the second-floor lecture room where he had taught his classes. Honor guards stood watch throughout the night. Then at 10:00 a.m. on May 15 the casket was transported upon a caisson to the Presbyterian Church for the funeral, then at noon to the cemetery. He seems to have accounted for every moment that Jackson’s remains were in Lexington. Colonel Francis Smith was the Superintendent of VMI when Jackson first came there, and still occupied that position at the time of Jackson’s funeral, but you are right that then-Major Preston served as Acting Superintendent during a time when Francis Smith was away in Richmond right at the beginning of the war. Shortly thereafter Preston left Lexington for Harper’s Ferry to serve on Jackson’s staff. Amanda, I appreciate you taking the time to get back to me as well as the information. I guess the fraternity can finally put to rest the stories of Jackson “haunting” the old fraternity house. Enjoy your site. Thanks Amanda for the great reply. You are right about Robertson having accounted for every minute of Jackson’s funeral procession through Lexington. Thanks again for responding and thanks for reading ECW! Thanks Al for the great question. Amanda beat me to the answer but she did a great job responding. Thanks again for reading the post! I left a second national flag upon the grave on the 150 year anniversary of his passing here in Lexington. The flag was signed by me, and workers at his Winchester Headquarters museum employees.